Why Did the DNC Move Obama’s Speech Inside: Weather or Low Turnout? Four years after accepting the Democratic nomination in front of 85,000 spectators in Denver, the 2012 DNC has elected to move Obama’s acceptance speech from Bank of America Stadium to the far smaller Time Warner Cable Arena. According to Obama campaign officials, weather prompted the move—making this the second straight convention forced to reschedule on account of mother nature. The forecast calls for a 20 percent chance of precipitation. While that’s not much, the forecast suggests the storms could be relatively strong, even if they’re scattered. The National Weather Service notes that the storms could be "quite a bit" stronger the scattered showers of recent days, even observing the possibility of isolated severe storms or microbursts, and it does not take a severe thunderstorm to severely disrupt an outdoor event. Obama’s speech represents the campaign’s single best opportunity to have their candidate deliver his uninterrupted case for reelection, so I won’t completely dismiss the possibility that even a low risk of a storm strong enough to severely interrupt the event was a solid justification for moving the venue. But if your event is so important that even a low chance of storms will cause you to cancel, you don’t plan an outdoor event during the summer in the American south. 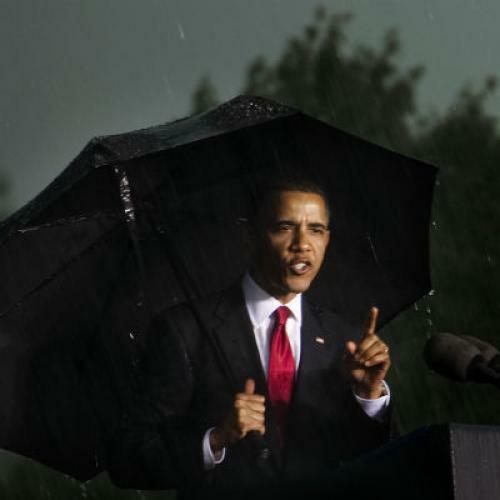 Throughout the southeast, late day thunderstorms routinely pop up in the hot, humid, air of August and early September, and if the Obama campaign weren’t willing to deal with a 20 percent chance of precipitation, why would they have entertained an outdoor speech in Charlotte in late summer? Instead, some say the event was canceled because Obama couldn’t fill the stadium. And if they couldn’t, it’s not hard to see why. No matter how you look at it, getting 75,000 people to attend an event in a modest city like Charlotte is really quite difficult: 75,000 people would constitute 16 percent of all Obama voters in the Charlotte metropolitan area, 3.5 percent of all Obama ’08 voters in the entire state of North Carolina, 8.5 percent of all Obama primary voters in North Carolina, or 3 percent of the total population of the Charlotte metropolitan area. The task of filling a stadium in Denver is somewhat easier on paper, but the enthusiasm surrounding Obama’s historic candidacy is really what made it look easy four years ago. With enthusiasm flagging, a repeat performance could have been out of reach. But according to the Obama campaign, 65,000 seats were already filled. That's might not be completely full, since they put 85,000 folks in a similarly sized stadium in Denver. But between the top rows of the stadium, the area immediately behind Obama, and a scattering of empty seats throughout, 10,000 empty seats might not pose a prohibitive “optics” problem. Of course, the Obama campaign’s decision to switch venues might just demonstrate that my uninformed speculation about stadium optics is wrong. After all, there were big downsides to switching venues—thousands of disappointed volunteers and fans, those nice luxury boxes—so they must have been pretty concerned about either the optics or the weather. Both explanations are plausible, but neither are air-tight, at least from my perspective. Either way, the Obama campaign lost an opportunity. By all accounts, Obama's speech in Denver endowed Obama with an army of new volunteers and text messages to their friends and relatives. With Obama down slightly in most polls in the Tar Heel state, a big speech to rejuvenate the enthusiasm of tens of thousands of North Carolina volunteers could have been extremely useful. Perhaps more than any other state, North Carolina is all about turnout. If switching venues cost the Obama campaign a fantastic organizing opportunity, the optics or weather risks must have been serious, at least in the Obama campaign's judgment.